Panda Cloud Antivirus Pro is an extremely light and fast cloud-based (Collective Intelligence) anti-virus suite, which combines anti-virus, anti-spyware, anti-rootkit, behavior analysis of running process, PC vaccination and automatic USB vaccination into a single package, aiming to protect your personal computer from virus, spyware, rootkit, unknown malware and other malicious activity. Panda Cloud Antivirus Pro with user-friendly interface normally costs $29.99 for purchase. As part of Panda / Facebook promotion, the interested users are now entitled to enjoy the free 6 months subscription for Panda Cloud Antivirus Pro edition. To get a free 6-month Panda Cloud Antivirus Pro, visit Panda’s Facebook promotion page and click the “Like” button, followed by downloading the special setup installer (half-year subscription) of the Panda Cloud Antivirus Pro with a single click on the Download Now! button. Alternatively, just download the setup installer of Panda Cloud AntiVirus Pro without even visiting Facebook page: PandaCloudAntivirus.exe. Panda Cloud Antivirus Pro edition supports Microsoft Windows 7, Windows Vista and Windows XP platforms. 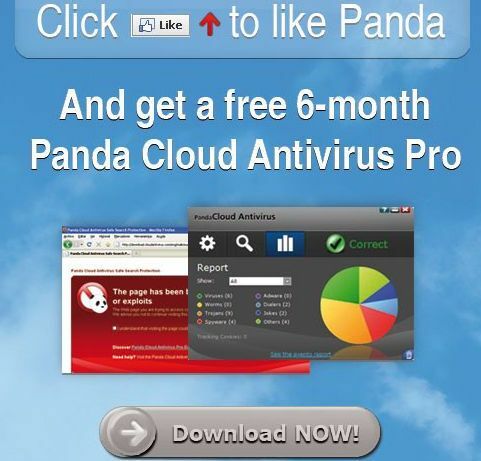 Note that the free version of Panda Cloud Antivirus is always free.